At GURU, we are consumers too; just like you. We know that sometimes products breakdown or suffer accidental damage. So we have your back, whenever you need help. Get warranty coverage catered to your needs. Applicable only to COURTS purchases. We’ll help you set up or fix up your items no matter where you bought them. Leave it to our certified service team to clean and maintain your household fittings. Don’t panic! Our professional repair team will get your products up and running again. We’ll help you keep your cool, when your aircon won’t. When your small appliances have issues, we'll come to the rescue. Install, maintain & clean your fans to spread some fresh air. When IT is a nuisance, we’ll lend a hand with mighty solutions. Cracked, damaged or lagging, we're here to take care of your phone. We'll help you keep your home appliances running efficiently. Stains, rips or scratches, we'll take care of your furnishings. We'll set up your home theatre and fix them when setbacks occur. Our skilled electricians can do the heavy lifting for you. From plumbing to furniture assembly our handymen have your back. Boost your home’s IQ with our Smart home packages. We’ve compiled a list of the questions we get asked the most often. Simply click on one of the links directly below. I’m interested in purchasing the extended warranty. What are the prices like? Depending on the product and the years of coverage, the price of our extended warranty differs – starting from as low as $0.10 per day. To find out more, contact us at guru@courts.com.sg, call 1800-222-6868, or head to your nearest COURTS store. I’ve just made a purchase at COURTS and want to add on the extended warranty. What should I do? 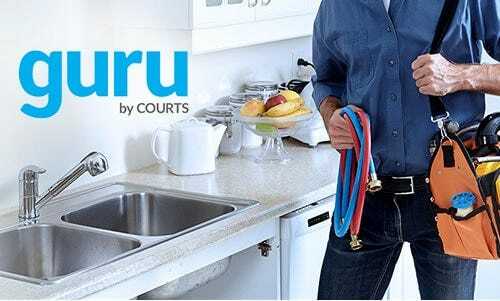 For online customers who wish get the extended warranty, please contact us at guru@courts.com.sg, or call 1800-222-6868; within 14 days of your purchase. If you have purchased the item in-store, you may contact your salesperson, or head back to the store to add on the extended warranty; within 14 days of your purchase. Can I purchase the extended warranty for products not bought from COURTS? Unfortunately, purchase of the extended warranty is currently unavailable for products not bought from COURTS. However, rest assured that we are working on bringing the service to you. Do I need to register for the extended warranty? No registration is required for the extended warranty. Your coverage starts the day after your manufacturer's warranty expires; depending on the date of your purchase. I’m having problems with my product. How do I make a claim? Simply contact us at guru@courts.com.sg, or call 1800-222-6868, and we’ll be glad to help. Get A Peace Of Mind With GURU Today!